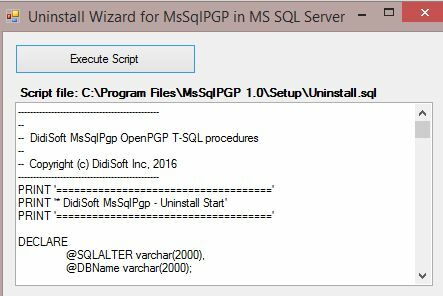 The setup of MsSqlPGP consists of an installer wizard that copies the files of the product and actual registration of the Transact-SQL scripts and the .NET assemblies where they are implemented as used defined stored procedures. The first part of the process is done through the setup installer wizard. The manual registration of the Transact-SQL scripts provided by MsSqlPGP can be done by copying the [Installation folder]\Setup sub folder to a target server machine and modifying by hand the paths to the \Setup\Bin folder in the \Setup\Stored_Procedures.sql script. The upgrade process is automated and is equivalent to the Setup. The upgrade from evaluation version to a fully functional production copy is done just like the Upgrade through the normal setup in the same database where the trial version resides. The Uninstall just like the Setup can be done automatically through the Uninstall wizard or manually by hand. If you wish to make a manual uninstall, first run the [Setup folder]\Setup\Uninstall.sql SQL script against the target MS SQL Server® database from Microsoft SQL Server Management Studio or other tool that you use for T-SQL development. Then manually delete the folder where the product was installed. This chapter discussed how to install, upgrade and uninstall DidiSoft MsSqlPGP against an MS SQL Server® database.